“There’s no crying in baseball!” One of the best movie lines EVER! That’s Tom Hanks yelling at one of the female baseball players in the fictional film about the formation of the All-American Girls Professional Baseball League. 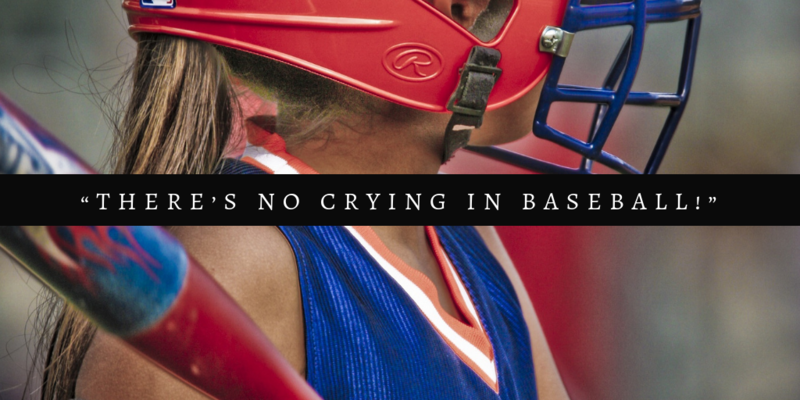 It was depicting a time where women were not considered capable or strong enough to play baseball…a mere game. The shortage of men due to the war made society give them a chance to be “capable” – sometimes all that is needed is a chance and the right environment to make success happen. In 1941, ONLY 75 years ago, laws were first signed prohibiting employment discrimination based on race, color or national origin. Although wheels of change were turning, it was almost 50 YEARS later for any movement around discrimination toward individuals with disabilities in the workplace. It took a lawyer, disabled by a spinal muscular atrophy, being forced to take a government job because nobody else would hire him. Evan J. Kemp, Jr., ultimately the chairman of the EEOC, couldn’t get hired – less than 30 years ago. I’m going to give you two lists to read and ponder for a moment. List #1: Stephen Hawking, Theoretical Physicist; Helen Keller, Activist; John Nash, Mathematician; Vincent van Gough, Painter; Beethoven, Composer; Ralph Braun, Businessman & CEO of Braun Corp.; John Hockenberry, Emmy Award winning Journalist. List #2: ALS, Blind/Deaf, Schizophrenia, Mental Illness, Deaf, Muscular Dystrophy, Spinal Cord Injury. The first is a group of famously talented individuals and their professions. The second is the list of their disabilities. The world gets so much more benefit from focusing on the first list of abilities, rather than the second list of disabilities. My question to you, does your organization, process flows, training, and behavioral environment encourage a mindset of finding ways to enable an employee to be their best self at work or does the overarching theme of your company see what the employee can’t do leading the way? This may be a chicken and egg discussion, but there are two critical components to consider. I am only going to address the first one today – the training and tone set for the frontline supervisory individuals is critical. Equally important is the senior leadership approach, but that’s a discussion for another day. I personally believe your greatest risk is with those who are directly managing staff, as they are the ones who will be the first to identify an opportunity to support. However, they are also potentially the first ones to behave in a manner that is exclusive, rather than inclusive; that is discriminatory, rather than interactive with a solution focused mind. What does your training look like? Do you have training? Ensure your managers are fully informed on why it’s in the best interest of the company to work with an existing, previously trained employee. Many do not recognize the costs associated with the replacement of an employee. It can give different perspective on how they approach things. There must be familiarity with what an interactive process must be, what kind of language or circumstance that could even possibly trigger the need for the interactive process and what discrimination looks like. What and how to document even the simplest, non-contentious situation is a learned skill that must be taught. It could be an effort to do right by the employee that is the offending behavior. Perhaps a manager doesn’t give an employee a particular project because they think it would be too stressful now that she just had a baby and surely doesn’t want to have to work longer hours. If they don’t know what they don’t know, that is on you to own. Did you even know that JAN (Job Accommodation Network) is a government funded resource specifically designed to support employers? Just to get you started, here is one place to start the process if you have concerns. I already said I think the frontline managerial staff is the greatest area for risk, but I must give equal concern to the overall tone of the organization, which is generally set from the top down – or possibly middle management down. There’s nothing more fun than telling your boss’ boss they are discriminatory, right? Members at all levels of the organization can and should be observant and proactive when it comes to situations that could be in violation of the ADA. The silver lining to this cloud is that it all circles back around to training, which is where I’m going to pick up next time. We haven’t even gotten close to the seventh inning stretch, so go get your popcorn and we’ll meet back here next week.